See that small pixel? That’s an entire moon you’re looking at! Peeking between the rings of Saturn is the tiny saucer-shaped moon Atlas, as viewed from the Cassini spacecraft. The image is pretty, but there’s also a scientific reason to watch the planet’s many moons while moving around the rings. “Although the sunlight at Saturn’s distance is feeble compared to that at the Earth, objects cut off from the Sun within Saturn’s shadow cool off considerably,” NASA stated. And if you look at Atlas close-up, it looks a little like a flying saucer! The moon is only 20 miles (32 km) across, which is a bit shy of the length of a marathon. The Voyager 1 team spotted the moon in 1980 when the spacecraft zoomed through the system. You can learn more about Saturn’s moons here. Cassini is still in excellent health (it arrived at Saturn in 2004, and has been in space since 1997), and scientists are eagerly getting ready for when Saturn gets to its summer solstice in 2017. Among the things being looked at is a hurricane at Saturn’s north pole. While most eyes on Earth have been focused on the Red Planet and the eventful landing of the Curiosity Rover, other missions throughout the Solar System are delivering stunning vistas as well, such as this image from NASA’s Cassini spacecraft of tiny moon Atlas as it shines just above Saturn’s rings. 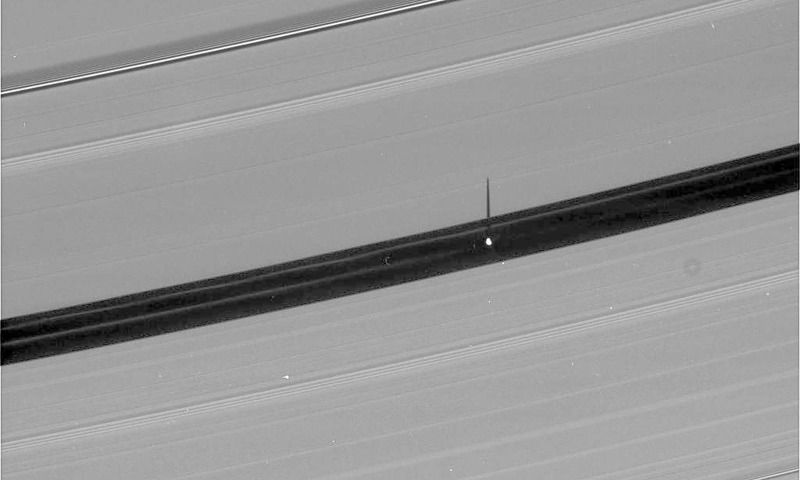 Atlas, just 30 kilometers (or 19 miles) across, sits just above the ring plane in this image taken by Cassini’s narrow-angle camera on April 16, 2012 at a distance of 1.4 million kilometers (870,000 miles). At this distance, Atlas appears as a small white dot. Atlas orbits Saturn between the main rings and the thin F ring. Cassini arrived at Saturn in 2004 and is now in its second extended mission called Cassini Solstice Mission. For the past two years, Cassini cruised in an equatorial orbit flying close over several moons including Titan and studying the planet’s iconic rings. Over the next three years, Cassini will hurtle high above the poles, sending the probe through the ring plane many times.